Al Mukalla: The Yemeni government forces, backed by massive air support from the Saudi-led coalition, moved deeper into Al Houthi-held territory in the northern province of Jawf, after taking control of the largest district in the province, local commanders and state-run media outlets said on Sunday. 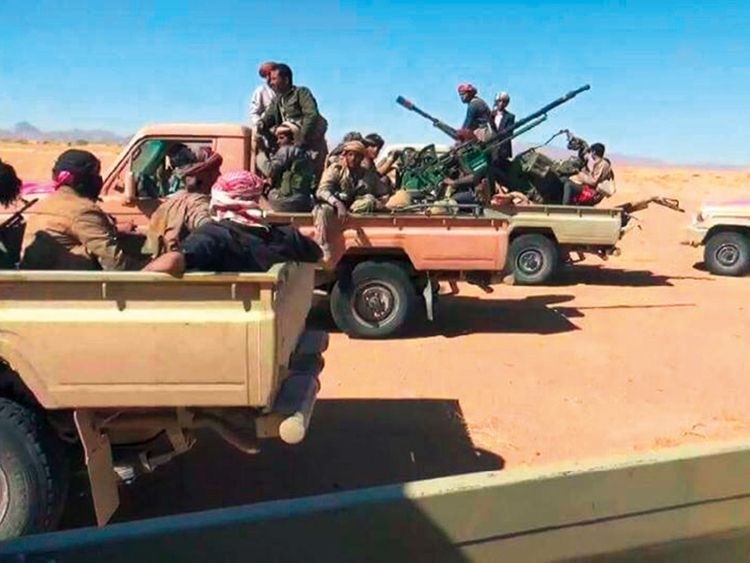 Abdullah Al Ashraf, a spokesperson for the 6th Military Region, said army troops and allied tribesmen seized control of almost 90 per cent of Khab Al Sha’af, the largest district in Jawf, after ousting Al Houthis from Al Youtmoa region, the district’s centre. Al Ashraf said Al Houthi forces suddenly crumbled and government forces arrested more than 45 militants and seized several armoured vehicles, three tanks and “a large stash of arms” abandoned by the defeated Al Houthis. After taking almost complete control of Khab Al Sha’af, government forces have squeezed Al Houthis in three small districts. By the end of Sunday, government forces reopened a strategic road linking the province of Jawf with Saudi Arabia through Sa’ada, Al Houthis’ main bastion. Military experts said government forces can now dispatch military supplies from Jawf to Sa’ada where loyalists battle Al Houthis in Bouqa and Baqoum regions in northern and east of the province. Yemen’s Defence Ministry said on Sunday army troops liberated the first village in Bart Al Anan district, one of the three districts that remain under Al Houthi control. The militants abandoned their position in Efi village after loyalists laid siege to their positions and cut off military supplies. Government forces have made rapid territorial gains in Jawf after rolling into the province from the neighbouring Marib. Several military posts, the province’s capital and a number of key urban areas were recaptured by the government last year. Jawf’s governor and other senior officials who decamped to Marib after Al Houthis’ occupation have returned to Hazem, the capital. In the central province of Bayda, the state-run Saba news agency said government forces have secured their positions in Noaman and Natea districts and are now battling Al Houthis in small pockets of territories in the two districts. Dozens of Al Houthis have been killed or captured since December 15 when government forces successfully rolled into Bayda after taking complete control Al Houthis’ last bastion in the southern province of Shabwa. Saba new agency reported on Sunday that the army had sent heavy military equipment to Bayda to help government forces continue with their offensive. Fighting was also reported in the southern province of Lahj where government forces announced on Sunday they had liberated a mountain. The Defence Ministry said government forces mounted an offensive on Al Houthi militants on Al Garen mountain in the district of Tour Al Baha, east of Lahj. Local commanders said Al Houthis use these rugged mountains as bases for launching rocket attacks on villages. In the Saudi capital, Saba said Yemen’s internationally-recognised President Abd Rabbo Mansour Hadi called the army’s chief of staff, Taher Al Ouqaili to congratulate him on the fresh victories in Nehim, Red Sea, and Jawf battlefields. Hadi ordered his troops to intensify military operations until they oust Al Houthis from Sana’a and other provinces under their control. The Saudi-led coalition intervened militarily in Yemen in March 2015 to blunt Al Houthis’ rapid military expansion and restore Hadi’s government. After thousands of heavy air strikes by the coalition, Hadi’s forces seized the momentum and scored major territorial gains across the country. Loyalists have resumed attacks on stalemated front lines, taking advantage of the growing resentment against Al Houthis after the ruthless killing of Yemen’s former president Ali Abdullah Saleh on December 4. Dozens of military officers and politicians from Saleh’s camp switched sides and vowed to fight along with government forces.